When we think about virtual reality (VR) technology, our minds tend to dart instinctively to the realms of video games and consumer technology, where VR has risen steadily to prominence over the years. More recently, we’ve seen examples in the retail industry, with projects such as home furnishings company Wayfair bringing virtual reality experiences to customers in-store, inviting them to don an Oculus Rift headset and view products on sale in 3D virtual settings. 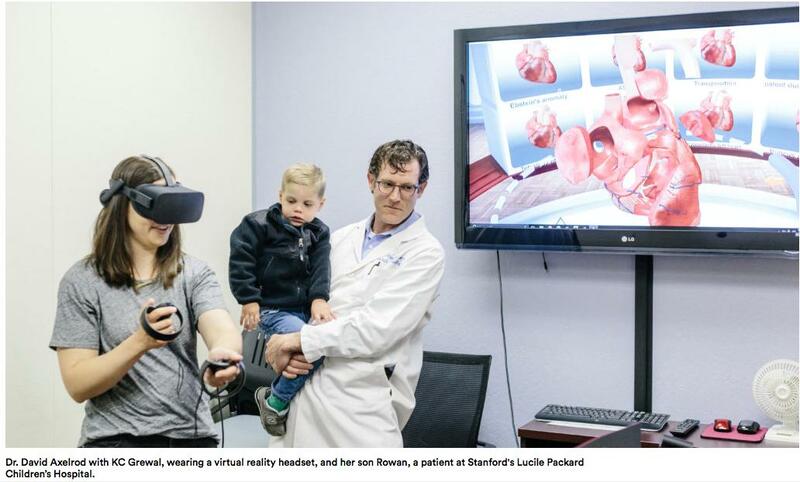 But earlier this year, Lucile Packard Children’s Hospital Stanford unveiled a project that surely puts VR technology to its most life-changing and important use to date – the Stanford Children’s Heart Center Virtual Reality Program. The project brings the immersive technology to healthcare for both providers and patients in a three-part VR program. The renowned Children’s Heart Center, where leading Stanford pediatric cardiac specialists perform in excess of 2,000 cardiac procedures each year, will form the testing ground for a range of ground-breaking VR tools designed to improve patients’ education, health, and hospital experience, while helping physicians treat cardiac patients more effectively. The first project – the Stanford Virtual Heart – enables users to “teleport” inside 3D virtualizations the heart to understand complex congenital heart defects, which can be some of the most difficult medical conditions to grasp even for professionals. In this way, it tackles what has always been a challenge for medical trainees – visualizing a beating heart in three dimensions. “I can literally see where the blood’s coming from and where it’s going in a way that I never had,” said Dr. Christopher Knoll, a Stanford Pediatric Cardiology Fellow after trying out the system for the first time. 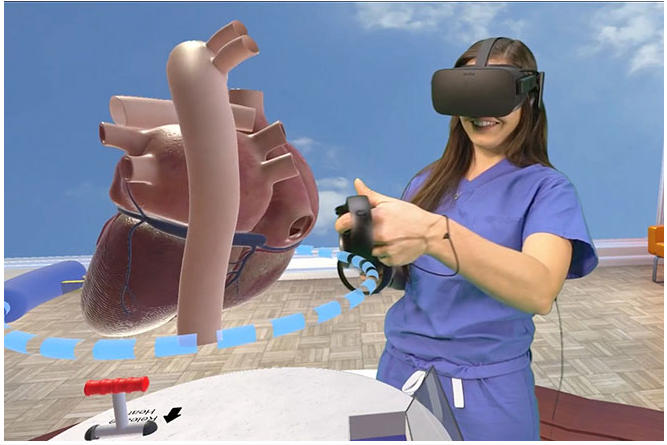 The Stanford Virtual Heart was designed by Stanford cardiologists and cardiothoracic surgery experts along with VR education producers at Lighthaus Inc., and funded by Stanford’s Division of Pediatric Cardiology and Facebook’s Oculus VR subsidiary. 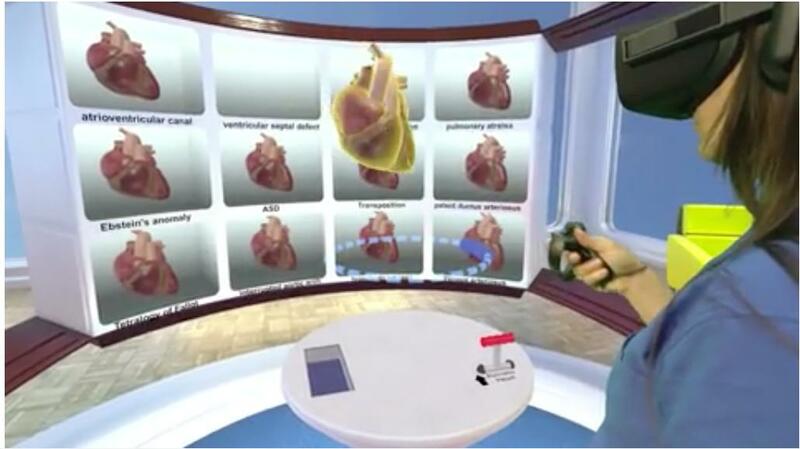 Users need to slip on a pair of VR goggles, and are then immersed in a virtual world where dozens of 3D hearts beat away on a shelf – each labelled by congenital defect. Using a hand-held controller, users can drag a heart hovering in front of them, where it can be spun on its axis or exploded into sections which will continue to pulsate in synchrony. Pushing a button on the control zooms the user inside the heart where streaming blood cells can be seen, and with another command the defect can be “surgically” fixed, rendering the heart normal. “It gives you a much better understanding of what you will be looking at in the operating room,” said Dr. Luca A. Vricella, Chief of Pediatric Heart Transplantation at Johns Hopkins University School of Medicine. It’s not just students and medical professionals who benefit from and get to use the technology. Patients, too, are invited to put on the goggles so that they can get a better grasp of how surgeons repaired defects in their hearts. This is the goal of the second program – Project Brave Heart – a pilot study led by Anne Dubin, MD, Professor of Pediatrics, and Lauren Schneider, PsyD, Clinical Assistant Professor of Child and Adolescent Psychiatry. Its aim is to explore the use of VR for “stress inoculation therapy”, which strives to help young patients mitigate pre-procedure anxiety through cognitive behavioral therapy (CBT) techniques. The Project Brave Heart VR experience leads study participants (ages 8-25) who have a scheduled cardiac catheterization procedure through a virtual tour of what they will experience on the day at Packard Children’s. It begins with checking into the hospital, and then moves on to falling asleep in the Cath Lab, and concludes with waking up in the recovery room. Patients are also introduced to the staff they will encounter along the way (including doctors, nurses, and technicians), and they also have opportunities to enter therapeutic VR relaxation and meditation experiences during moments of stress or anxiety. The idea is that by preparing young people in advance for their hospital experience, patients will feel calmer and more at ease with the process, which may reduce the need for sedative medications prior to the procedure. VR headsets are sent home with participants, and the VR experience is then driven by a proprietary app that can be downloaded onto their smartphones. To determine the technology’s effectiveness as stress inoculation therapy, children’s heart rates, blood pressure and cortisol (a stress hormone) levels are measured before and after the catheterization, and comprehensive questionnaires are administered to document the child’s reported levels of stress and anxiety. “We want to find out if young patients who use VR have less anxiety because they have been exposed to a very realistic experience of what will happen at the hospital on procedure day,” says Dr. Dubin. The third program uses True3D virtual imaging technology to help surgeons virtually map their route inside the operating theatre. The 3D images can be viewed prior to surgery as well as in the operating room itself, and essentially allow pediatric cardiac surgeons to conduct a virtual run-trough of a procedure before surgery using 3D models constructed from CT and MRI scans. All three VR initiatives are of course still only in the early phases of implementation, but already doctors at Stanford are considering how VR can be expanded across a wider range of the hospital’s departments in the future. It’s believed that the technology can be used in similar ways to help patients with cancer, neurological diseases, hearing issues and those that need organ transplants. Indeed, additional VR initiatives are already underway that are designed to help patients manage pre-operative and procedure-related stress. Using VR to its full potential is the clear goal for Packard Children’s. From improving medical training to aiding surgeons to enhancing the patient experience, these exciting and potentially life-changing initiatives that have begun in the Children’s Heart Center will continue to grow, and all eyes are on Stanford to see what comes next. Hear Christine Cunningham, Administrative Director, Office of Patient Experience, Stanford Children’s Health at Next Generation Patient Experience 2017 this November.